Government bureaucrats, central bankers, and Wall Street executives all have their own reasons for hating the cash in your wallet. So, no surprise, they are working closely together to rid you of it. The war on cash is intensifying and bullion investors are wondering what the transition to a "cashless society" might mean. We'll cover that, but let's first recap why these organizations are, once again, allied together to the detriment of your ability to transact privately. The self-interest of bureaucrats is one factor. They don't like privacy. They dream of the day when they can access all of your spending with just a few keystrokes. The knowledge will help them more aggressively tax and regulate. Central bankers want something a bit different. The policy du jour among these central planners is NIRP – negative interest rate policy. Bankers in Switzerland, Sweden, Denmark, and Japan have already launched NIRP. Their counterparts elsewhere, including the U.S., are planning for it. The challenge is to create an environment where customers must either spend their savings or pay their bank interest to hold deposits. 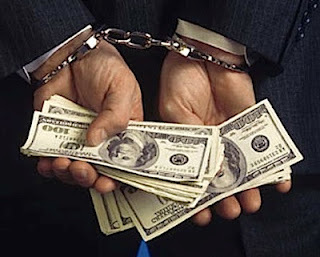 To succeed, the government must corral citizens into purely electronic money. Otherwise many will simply withdraw cash and hide it under a mattress. When you have to pay a bank to borrow your money, holding physical cash gives you a higher yield, i.e. 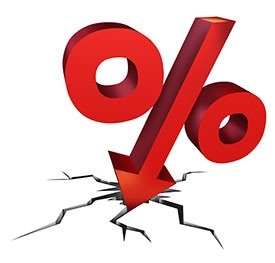 0% interest is a higher yield than negative 1%! Bank executives are licking their chops at the potential for all transactions to be done electronically. They stand to rake in processing fees every time you use your card or cell phone to make purchases rather than using cash. Plus, they will gather a larger deposit base as customers no longer have the option of holding paper money outside the banking system. People need to keep these motivations firmly in mind, because politicians and bankers aren't going to be honest about why they want to eliminate cash. Wall Street wants you to focus instead on the convenience of electronic payments. And bureaucrats are busy stigmatizing cash as a tool for drug dealers, tax cheats, and terrorists. Perhaps Americans will see through the propaganda and recognize just how dangerous a cashless society would be to their wealth and privacy. They might decide to punish banks such as JPMorganChase for no longer accepting cash payments on loans and insisting customers not put cash in their safe deposit boxes. They may ask their elected representatives to oppose any measure to eliminate paper bills. However, most Americans aren't paying much attention to the issue. Congress is barely accountable, and the Federal Reserve isn't accountable at all. A restriction on cash could indeed be imminent. That'scertainly the goal of the "Better Than Cash Alliance". 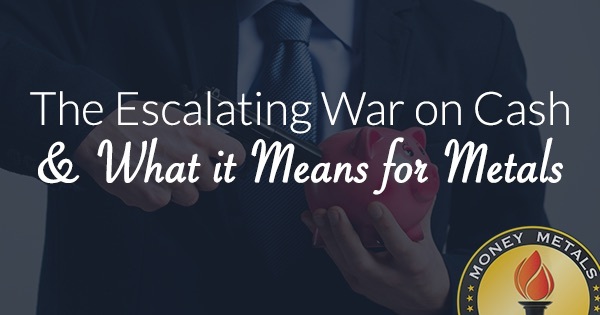 If citizens ultimately lose the War on Cash, here are some likely ramifications for precious metals investors. Negative rates should drive significant demand for gold and silver. NIRP is a testament to the fact that central bankers will try literally anything to produce inflation. Such an extraordinary policy should set off alarm bells for anyone who isn't concerned about inflation, or is betting on deflation. If central bankers want inflation, they have the power to create it. As always, inflation fears will drive demand for physical bullion. 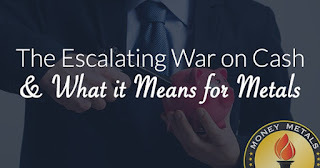 The good news is that while bureaucrats can theoretically win the War on Cash because they have complete control over the issuance of paper money, they cannot win a war on bullion. Metals don't roll off a printing press that can simply be switched off. Physical bullion is private and off-the-grid – a nightmare for regulators. If they attempt taxes and regulation, they will fall victim to the law of unintended consequences. But that may not stop them from trying. It's happened before – most recently in India. Indian officials dramatically hiked the tariff on imported gold in 2013 They accomplished little more than angering a gold-loving population and driving an eight-fold increase in gold smuggling. Politicians and their friends in banking aren't going to stamp out peoples' desire, or their ability, to transact privately using barter instruments such as gold and silver coins. And they aren't going to force unwilling people to stand idly by as they take shears to savers; bank accounts. The push to eliminate cash will inevitably push people into cash alternatives including physical precious metals.